We provide systems for inspecting multi-layered, double-sided, and single-sided build-up boards and a range of other printed circuit boards under high speed and precise conditions. 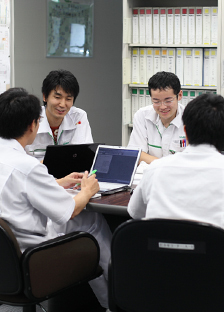 The tester is the heart of inspection systems. 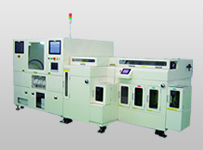 An advanced system used for continuity (OPEN) tests, and short circuit and insulation (SHORT) tests of semiconductor packages or high-density build-up boards. We provide systems used for function tests, laser trimming, and automatic regulation of packaged printed circuit boards, hybrid ICs, and a range of other electronic components. 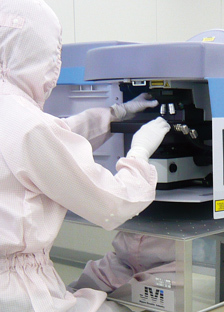 A system used for inspecting the appearance of printed circuit boards, semiconductor packages, or LEDs by processing images using cutting edge technology. This system takes advantage of contact and contactless technologies to check the continuity and short circuiting of touch panels and LCDs or LED boards, and identifies non-defective units. We develop and suggest an optimized automated measuring system for home appliance components according to customer requests. We develop and suggest an optimized automated measuring system for automotive components according to customer requests. We offer a wide range of software products that make full use of high-speed image processing systems, and a broad lineup of other models that supports any type of contactless inspection. The cylindrical bore internal surface inspection system is used to inspect porosity, gouge, separation, burrs and chips and other defects on the fabricated bore surface of die-cast products. In addition to our current product lineup of load gauges, tension meters, revolution counters, and torque meters, we developed thermometers, film thickness meters, heat stress indicators, and electric & air micrometers to continuously expand our product lineup.